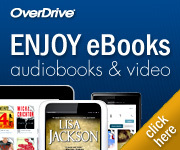 New E-Books & Streaming Videos Up In Digital Catalog Today! by Linda Reimer.In Uncategorized.2 Comments on New E-Books & Streaming Videos Up In Digital Catalog Today! Hi everyone, just a heads up — there are brand new e-books and streaming videos available today in the Digital Catalog! Here’s a link to a PDF list of those titles! person would be. Don’t go more than 20 minutes or you may feel groggy. claims to your insurance company. Next Next post: What On Earth Is ANSCR?